The bracket is retractable and can fit mobile phones with 56-85mm wide screens. Made from reinforced plastic with rubber padded inner to keep your phone safe and secure during use. Features two differently positioned screw threads allowing you to mount your phone vertically or horizontally. 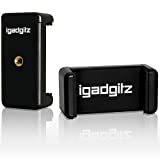 The iGadgitz smartphone tripods mount is easy to install and convert your smartphone into a digital camera on any sized tripod with a 1/4″ screw thread. The unique two screw holes design allows you to mount your phone vertically or horizontally. This entry was posted in Discount Photography and tagged Adapter, Bracket, Holder, iGadgitz, Mount, Selfie, Smartphone, Sticks, tripods, Universal by Ball Photo. Bookmark the permalink.